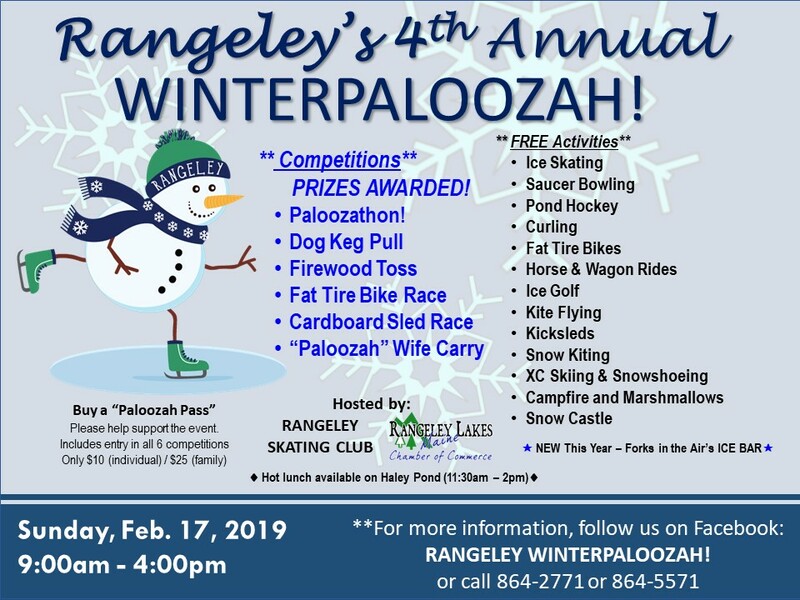 RANGELEY - The Rangeley Skating Club and the Rangeley Lakes Chamber of Commerce are pleased to announce the 4th Annual Rangeley Winterpaloozah! event, a fun-filled celebration of winter activities and competitions for the entire family. The event will take place on Sunday, Feb. 17, 9 a.m. to 4 p.m. at Haley Pond and Rangeley Town Park. The Skating Club and the Rangeley Lakes Chamber of Commerce have teamed up again to host the event, which will include all the favorites from past years - skating, curling, pond hockey, fat tire bikes, snowshoes, kick sleds, horse & cart rides, marshmallow roast, snow golf, snow kite, snow castle and more - All FREE! A new event this year will be saucer bowling. For the second year, there will be a slate of pay-to-enter competitions for the entire family (including canine family members), with prizes awarded to winners in each competition. Competitions include Cardboard Sled Race, Dog Keg Pull, Firewood Toss, "Paloozah" Carry (a variation on the popular wife-carry event), Fat Tire Bike Race and the "Paloozathon" Race. The day will kick off at 9:00 AM with the "Paloozathon" Race - a mini-triathlon consisting of snowshoeing, fat biking and running. The full schedule of events is available on the RangeleyWinterpaloozah Facebook page and the Chamber’s events calendar (www.rangeleymaine.com/events). Hot lunch will be available 11:30 AM - 2:00 PM on Haley Pond. In addition to supporting the event, purchase of a "Paloozah Pass" entitles the purchaser to entry in all competitions. Paloozah Passes are available at Ecopelagicon and the Rangeley Lakes Chamber of Commerce now and will be available on the day of the event as well. Follow updates on Facebook. For more information, contact the Rangeley Lakes Chamber of Commerce at 864-5571 or karen@rangeleymaine.com or the Rangeley Skating Club at 864-2771 or linda.dexter@icloud.com.